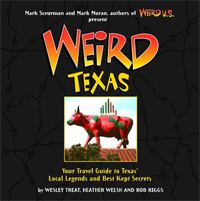 Backpacking through Europe is all well and good if you're looking for stories to impress the chicks, but if you just want to see the sights, you may as well save your euros and hit the good old Texas highways. The Eiffel Tower? Sure, we've got it right here in our very own Paris, where you'll have the added bonus of never running into a mime. Or how about Big Ben? Hey, the University of Texas clock tower is just as good, plus you can still see the bullet holes left by the men who brought down Charles Whitman. Then again, maybe you're interested more in ancient ruins like the mysterious Stonehenge. Well, we've got you covered there, too. And this one isn't falling over. Al Shepperd, a world traveler who was interested in ancient cultures, recreated the peculiar ring of stones at his home in Hunt in 1989. The idea came to him after his friend Doug Hill presented him with a large piece of limestone, which Hill was left with after building a new porch. Shepperd placed the stone upright in his field, then asked Hill to build an arch to direct attention to it. When the arch was complete, it reminded the two so much of England's monument, they decided to complete the set, reconstructing the entire thing in metal and plaster. 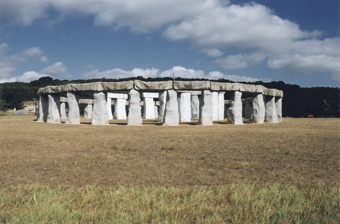 They dubbed the reproduction Stonehenge II. A year and a half later, when Shepperd returned from a visit to Easter Island, he employed Hill once again to help him build two giant stone heads. Then, after studying ancient Indian tribes in Alaska, he planned to add a totem pole to the collection. Unfortunately, Shepperd passed away before he and Hill got a chance to build it. 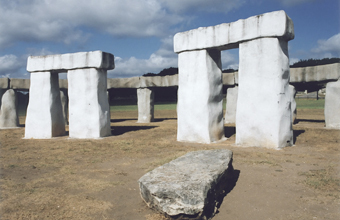 Thankfully, however, Stonehenge II and its companion heads have remained under the care of Shepperd's family and are still open to anyone who wants to stop by. Of course, this Stonehenge doesn't include any crystal-gripping, cloak-wearing geeks to make fun of, but a visit won't cost you £15 and, unlike the other one, you actually get to touch it.